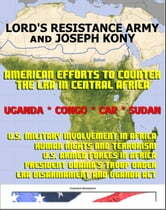 As America commits military personnel to Central Africa, learn about the Lord's Resistance Army (LRA), led by Joseph Kony. 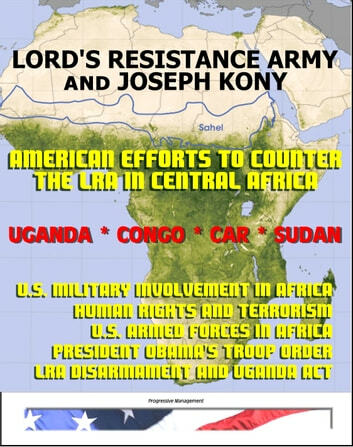 In announcing the deployment of U.S. military troops, President Obama stated: "For more than two decades, the Lord's Resistance Army (LRA) has murdered, raped, and kidnapped tens of thousands of men, women, and children in central Africa. The LRA continues to commit atrocities across the Central African Republic, the Democratic Republic of the Congo, and South Sudan that have a disproportionate impact on regional security. Since 2008, the United States has supported regional military efforts to pursue the LRA and protect local communities. Even with some limited U.S. assistance, however, regional military efforts have thus far been unsuccessful in removing LRA leader Joseph Kony or his top commanders from the battlefield. In the Lord's Resistance Army Disarmament and Northern Uganda Recovery Act of 2009, Public Law 111 172, enacted May 24, 2010, the Congress also expressed support for increased, comprehensive U.S. efforts to help mitigate and eliminate the threat posed by the LRA to civilians and regional stability." This essential compilation of government and military reports and papers, totaling over 700 pages, provides analysis and background data on the LRA and related issues includes extensive background information on Uganda, the Central African Republic (CAR), South Sudan, and the Democratic Republic of the Congo (Kinshasa). There is in-depth coverage of human rights and counterterrorism in those Central African countries, plus detailed information from the U.S. Africa Command (AFRICOM). There is review of the history of U.S. military involvement in Africa, the expanding role of U.S. military assistance and security cooperation in Africa, and the use of U.S. Armed Forces in Africa from 1950 to 2008. In May 2010, President Obama signed into law the LRA Disarmament and Northern Uganda Recovery Act, which reaffirmed the U.S. commitment to support regional partners’ efforts to end the atrocities of the Lord’s Resistance Army (LRA) in central Africa. For more than two decades, the LRA has murdered, raped and kidnapped tens of thousands of innocent men, women and children. Since 2008 alone, the LRA has killed more than 2,400 people and abducted more than 3,400. The United Nations estimates that over 380,000 people are displaced across Central African Republic (CAR), the Democratic Republic of the Congo (DRC), and South Sudan as a result of LRA activity. The United States’ comprehensive, multi-year strategy seeks to help mitigate and end the threat posed to civilians and regional stability by the LRA. The strategy outlined four strategic objectives for U.S. support: (1) the increased protection of civilians, (2) the apprehension or removal of Joseph Kony and senior LRA commanders from the battlefield, (3) the promotion of defections and support of disarmament, demobilization, and reintegration of remaining LRA fighters, and (4) the provision of continued humanitarian relief to affected communities. The United States’ decision to send a small group of military advisers to assist the forces that are countering the LRA forms part of our continuing effort to achieve these strategic objectives.